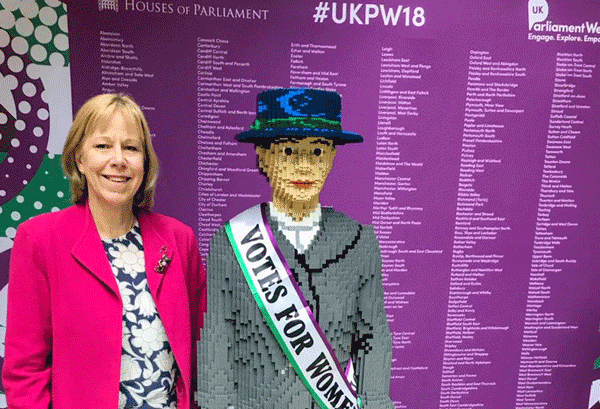 As we mark 100 years since the first women gained the right to vote, Ruth Cadbury MP is inviting everyone in her constituency of Brentford & Isleworth, which includes Chiswick, Osterley and Isleworth, to get involved in UK Parliament Week and play a part in our thriving democracy. Ruth Cadbury said: “I welcome the involvement of people in during UK Parliament Week 2018. I am determined to ensure that our voters and citizens of tomorrow understand how vital their participation is in our democracy, and I’m excited to see so many schools, Girlguides, Scouts and local groups taking part. I am delighted to welcome Parent Teacher Associations from schools across the constituency this Friday in Parliament. I shall also be visiting inter-faith events this weekend and will be supporting the #Vote100 #AskHerToStand campaign, in collaboration with the Jo Cox Foundation. It is important for us to come together to increase engagement in Parliament and bring people together, as Jo preached”. In 2017, UK Parliament Week reached more than 360,000 people, with over 4,500 events. This year’s UK Parliament Week festival is the largest ever and will see more than 7,000 registered events with over 500,000 people taking part. Participating organisations include Scouts, Girlguiding, and the British Youth Council. David Clark, Head of Education and Engagement at UK Parliament, said: “There are many exciting events as part of this year’s UK Parliament Week. Schools, workplaces and community groups across Brentford & Isleworth have a chance to get involved in their democracy, and to also celebrate one of the most important centenaries in British democratic history. We can only work towards a more equal society if we all engage with democracy so please find ways to get involved in with Ruth. 1. UK Parliament Week is an annual festival organised by the UK Parliament Education and Engagement Team, a service of the House of Commons and House of Lords which seeks to inform and educate all citizens about the work and role of the UK Parliament. Find out more about this year’s UK Parliament Week here. 2. This is UK Parliament Week’s eighth year. It began in 2011 and has grown year on year. Sign up to UK Parliament Week 2018 here. 3. Discover more about Vote 100 here.